CD reviews: "I'll Run Your Hurt Away" and "I Got A Sure Thing"
These are two of the better heavy soul albums of recent vintage. Trudy Lynn sings an earth-shaking blues/R&B in the mold of Katie Webster and Koko Taylor. Her world-weary tales of lousy men and love gone bad carry a sense of conviction and honesty that set the best blues singers apart. Lynn is blessed with a big-as-all-outdoors voice that lends itself to her rough-hewn music. She can get down and growl and snarl, yet has enough skill to pull off the softer songs as well. And with the sure handling of an artist fully in command, Lynn offers us spoken asides  "Now wait a minute, baby. You must be stuck on stupid, or else you lost your mind." She deftly fronts the small combo  guitar, bass, keyboards and horn section  like a veteran of the big band era. Another sign of the consummate vocal professional. In short, the blues world is likely to be hearing more from Houston's Trudy Lynn. 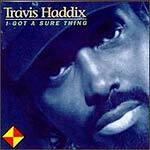 Although most folks haven't heard of Travis Haddix, he's no newcomer to soul/blues singing  he started out over 30 years ago. Haddix is a soul crooner from the school of Bobby Bland, Johnnie Taylor (with whom he once performed), Johnny Adams and Little Milton. His vision of the blues is urban and mellow, but with a certain edge left to his music. A fine songwriter, Haddix penned all but two of the songs here. All of the material suits his smooth, rich delivery and slightly nasal tenor voice to a T. The arrangements are Stax-tight, the backing band solid and swinging. This is as good a soul album as you'll hear.